This month we will be enjoying the fine fall weather on the patio outside in the courtyard at our pre-meeting social hour (cookies, coffee, vendors and plant forum). Meeting check-in will remain in the foyer and the meeting in the sanctuary. You may want to bring a jacket or sweater if it is a cool evening. Ruth Bancroft began planting her 31/2 acre dry garden in 1971, and started the actual plantings in 1972. A garden brimming with succulents was very much out of the ordinary in Walnut Creek in those days, but through trial and error she discovered what would grow there and what would not. In the 1990's the garden transitioned to a non-profit organization and opened to the public, and it is now open to visitors every day of the week except Monday. The talk will feature pictures of the garden from its beginnings to the present. It will also include information on plant introductions from the garden over the years. Brian Kemble is the Curator at the garden, and he began working there in 1980. He is passionate about succulent plants, and is also the Vice-President of the San Francisco Succulent and Cactus Society, and is on the Board of the Cactus and Succulent Society of America. Brian has made many trips to see succulent plants in habitat in Africa, Madagascar, Mexico and the southwestern U.S. He writes a column called On the Dry Side which runs in several newspapers in the San Francisco Bay Area. Before Brian's talk, Johanna Silver, the garden editor at Sunset, will do a short presentation about the latest and greatest of Sunset's Test Garden. After 70 years in the same Menlo Park campus, Sunset Magazine relocated to Oakland, with a brand new garden—4 times the size of our old one—in Sonoma. Learn how they divided the space into five distinct garden rooms, including some of the most exciting new plants on the market. Johanna Silver is a San Francisco-based writer, editor, and garden designer. She is the garden editor at Sunset, where she also manages the editorial test garden. Johanna is a regular contributor to Sunset magazines, books, and videos. 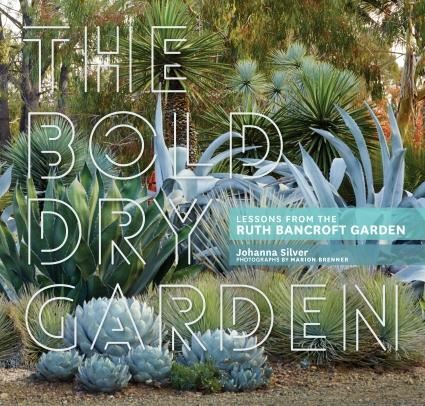 She is the author of The Bold Dry Garden, a history of the Bay Area's Ruth Bancroft Garden, published by Timber Press. Her writing earned her a James Beard Award in 2009 for her contributions to the One-Block Diet blog and an ASME award for General Excellence in 2014. Her website is johannasilver.com. Before and after the meeting Johanna will be selling and signing her book about the Ruth Bancroft Garden, The Bold Dry Garden. The presentations starts at 6:30. With 2 speakers the meeting run a bit longer than normal.